Printed in full color on 65lb card stock. Image and title correspond to item listing on website. Signed and embossed for security and authenticity. Numbered and recorded for reference. Our Certificate of Authenticity ensures that the item you receive is authentic, and used by the production as stated in the film or television show. We have worked in the prop and costume business for 8 years, and in that time we have dealt with original props, costumes, set decoration, artwork and various other types of memorabilia and have amassed a vast knowledge of the material. We pride ourselves in authenticating items, weather it be directly from studios, or secondary sellers. All items we sell are guaranteed to be authentic, and have been researched by our dedicated team to ensure that if you buy a “hero” prop, it is in-fact that! If you have any questions on the terminology stated in the description of items for sale on our site please email us, as we can describe to you the difference of a hero prop and a stunt prop, or a production made piece and a screen used piece. Our COA’s are printed in house, and feature a custom made adhesive logo with a corresponding number that is kept by us, so that if you need to verify the authenticity of the certificate at any time it can be referenced and checked. 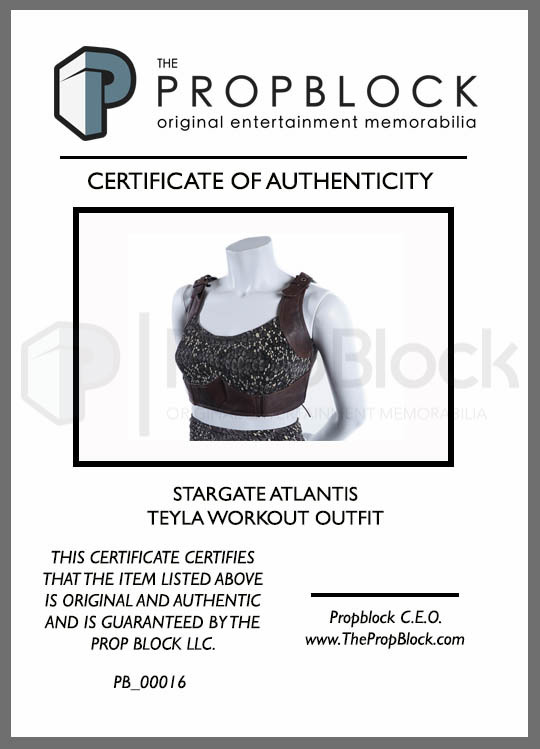 COA’s for items sold by us are issued only once, and the reference number is original to the prop or costume you buy!